Mountain lions that live in Los Angeles are in danger of becoming extinct in 50 years because their isolation leaves them vulnerable to inbreeding, which causes health problems and unusual behavior. Trying to leave their territory is very risky: Since 2002, 17 mountain lions have been killed trying to cross busy freeways in the area. Last year the California Department of Transportation (Caltrans) proposed overseeing the design and construction of a $60 million vegetated bridge across the 101 Freeway in Agoura Hills. It will allow mountain lions and other animals to travel from the Santa Monica Mountains to the Sierra Madre Mountains north of Los Angeles without the risk of being struck and killed by speeding cars. However, Caltrans said, 80 percent of the cost of the bridge must be covered by corporate and private donations. To help raise those funds, the National Wildlife Federation has joined with other advocacy groups in "one of the most ambitious fundraising campaigns ever held on behalf of local wildlife," according to the Los Angeles Times. The groups are optimistic the funds will be raised. Caltrans estimates that the bridge will be completed by 2022. But the longer it takes to build the bridge, the longer the lives of mountain lions and other animals are in danger. 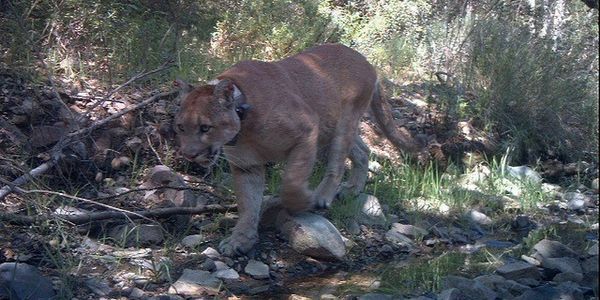 Please sign and share this petition urging Caltrans to build the wildlife bridge as soon as possible.